Eve is an experienced psychotherapist and counsellor. She also trains and supervises counsellors or anyone working in the helping professions. 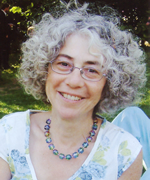 Since 1984 she has worked under the auspices of The Stroud Natural Health Clinic and has a busy practice. She works at her home in Edge. People seek counselling or psychotherapy for a variety of reasons including depression and anxiety, stress, loss or bereavement, relationship difficulties, and experiencing life as uncreative. Some problems can be traced to a history of childhood difficuties and others occur as we meet challenges or life transitions. Together we can explore the issues sensitively which can lead to greater understanding and new possibility for change. Eve offers short-term counselling to help people get over crises such as divorce, bereavement or stress related problems as well as longer term psychotherapy. As her original training was with Relate: she will see couples as well as individuals. Eve also offers a mentoring service for women who are setting up and working with groups of any kind and would benefit from her experience and wisdom. This could also be relevant to women of different life stages who rather than have therapy would like and benefit from support going through the challenging thresholds that life presents eg pregnancy, motherhood, menopause, ageing, illness etc. Contact her on 01452 813355 for further information about individual sessions, groups, supervision and training.